Flats Future, Feedback - Bambalapitiya Flats. 1. Articles submitted should have the writer's name. The latest Article will be at the top of this page. 2.The unedited copy and paste of the Comments and Feedback I receive by email, without the senders name or any other persons named in the comment will appear under the articles section. 3. I understand that there are many differing views about this subject. I pray that these differences can be resolved peacefully to the mutual benefit of all the flatters involved. We have written extensively in this newspaper about the proposed Bambalapitiya flats redevelopment project. Despite the revelations about the lack of financial standing of the promoter UTL Global Projects Pte Ltd to undertake a project of this magnitude, in March this year, the Cabinet granted approval to the National Housing Development Authority (NHDA) to sign an agreement with City Square Projects (Pvt) Ltd., a fully owned subsidiary of UTL Global Projects Pte Ltd with the proviso that they had to bring USD 10 million into the country within four to six weeks of signing the agreement. The Bambalapitiya flats redevelopment project is an ambitious one which seeks to demolish the present apartments and to use the ten-acre land, on which they stand to build six towers of 36 storeys each with a total of 3,762 residential apartments along with shops, offices and hotels. The present residents of the flats would be given 285 apartments and 12 shops after the completion of the project. Until the project is completed, they would be given a monthly allowance to live in rented houses. If financed and implemented properly, this would be a good project. However, the promoter of the project UTL Global Projects Pte Ltd, is a company that was incorporated in Singapore in February 2011 and its owners are three Indian nationals, Koorapati Premalatha Rani, Meena Pooja and Prashanth Koorapati - all members of the same family, without any known background in construction or real estate development or the financial resources to be able to handle a project of this nature. When this project was first mooted in 2014, UTL Global Projects Pte brought in as a partner, Patel Engineering Ltd a listed company in India, without extensive experience in real estate development or considerable financial clout. A tripartite MOU was signed on 29 March 2014 between UTL Global Projects Pte Ltd, Patel Engineering Ltd and the NHDA for this project. Subsequently, however, Patel Engineering Ltd backed out of the project. At that point UTL Global Projects Pte Ltd purported to bring in another Indian investor, Engineering Projects India Ltd, a state-owned entity in India, with extensive experience in construction and real estate and solid financial backing. UTL Global Projects Pte Ltd and Engineering Projects India Ltd, jointly submitted a project proposal to the BOI on 12 September 2014 to redevelop the Bambalapitiya flats at a cost of USD 250 million over a seven-year period. On Dec. 30, 2014 Vinoo Gopal the Director Projects, of Engineering Projects India Ltd wrote to the NHDA hat they were, in principle, ready to join UTL Global Projects Pte in the project to redevelop the Bambalapitiya flats. He also provided the NHDA with a letter from the Indian Overseas Bank, certifying that Engineering Projects India Ltd had the financial resources to be able to execute the USD 300 million project if it was awarded to them. Based on this application, on Dec. 14, 2015, the BOI wrote to UTL Global Projects Pte Ltd that they had approved the application they had made jointly with Engineering Projects India Ltd to redevelop the Bambalapitiya flats. The project was also given a 15-year tax holiday. On April 19, 2016, the General Manager of the NHDA wrote to UTL Global Projects Pte Ltd and Engineering Projects India Ltd that the Cabinet had approved their joint project proposal and that, in terms of BOI requirements, the two partners in the consortium should incorporate a company in Sri Lanka as a special project vehicle for this project. Thereupon, a company called City Square Projects Pvt Ltd was duly incorporated in Sri Lanka, but Engineering Projects India Ltd was not a part of this special project vehicle – a violation of BOI rules. City Square Projects Pvt Ltd is a fully owned subsidiary UTL Global Projects Pte Ltd., masquerading as a joint venture with Engineering Projects India Ltd. On June 22, 2016, a formal agreement was entered into between the BOI and City Square Projects Pvt Ltd. On March 05, 2016, City Square Projects Pvt Ltd signed an agreement with Engineering Projects India Ltd. But, up to the point of writing, Engineering Projects India Ltd does not own any shares in City Square Projects Pvt Ltd. The agreement states that Engineering Projects India Ltd ‘may’ purchase some equity in City Square Projects Pvt Ltd if their board and the Indian government agencies involved grant them permission. The promoter UTL Global Projects Pte Ltd has not revealed to the Sri Lankan government what exactly Engineering Projects India Ltd has undertaken to do in terms of this agreement with City Square Projects (Pvt) Ltd. The BOI and the NHDA granted the approval for the project on the assumption that Engineering Projects India Ltd had undertaken to invest USD 300 million in this project on the strength of the letter written by the latter to the NHDA on Dec. 20, 2014. The promoter has provided only a redacted version of the agreement between Engineering Projects India Ltd and City Square Projects (Pvt) Ltd to the Sri Lankan government, claiming that the rest of it was ‘highly confidential’. The reason why UTL Global Projects Pte Ltd is keeping the most important parts of this agreement secret is to conceal the fact that Engineering Projects India Ltd has not made any worthwhile financial commitment to the project. India Ltd joins City Square Projects (Pvt) Ltd it will be playing only a limited role as per the agreement. The Sri Lankan government has no inkling of how limited this role is because it has not seen the full agreement entered into between these two entities. If however, Engineering Projects India Ltd does not get permission from the Indian government, it will not be able to participate in this project even in that limited way. Now that the Cabinet has granted approval for the NHDA to sign an agreement for the project with City Square Projects (Pvt) Ltd, the land on which the Bambalapitiya flats stands will be transferred free of charge, on a 99-year lease to City Square Projects (Pvt) Ltd., which is wholly owned by three Indian nationals. If Engineering Projects India Ltd fails to join City Square Projects (Pvt) Ltd, three Indian nationals will hold a 99-year lease on ten acres of the best land in Colombo! Even if Engineering Projects India Ltd joins City Square Projects (Pvt) Ltd, that too means nothing because they have undertaken only a very limited role and the three Indian nationals who own UTL Global Projects Pte Ltd will still be calling all the shots. We have incontrovertible proof that what UTL Global Projects Pte Ltd intends doing once they get their hands on the land is to mortgage it to third parties. What will happen after that is anybody’s guess. UTL Global Projects Pte Ltd has obtained a letter from a local bank expressing its willingness to provide an ‘overdraft facility’ of USD 25 million to City Square Projects (Pvt) Ltd for the construction of residential towers in Colombo 4. The security that the bank will retain against the money advanced will be a mortgage over the ‘project assets’ which is, in effect, the Bambalapitiya land, which is to be transferred to City Square Projects Ltd. The government has imposed the condition on City Square Projects (Pvt) Ltd that within 4 to 6 weeks of signing the agreement with the NHDA, they will have to bring in USD 10 million to the country. This will not be difficult because City Square Projects (Pvt) Ltd will be able to use that very agreement to obtain money by pledging the land as collateral. Everything about this whole project smacks of a giant scam. The promoter has all made misrepresentations to the BOI and the NHDA and concealed information from the government without revealing the exact extent of the financial commitment made by Engineering Projects India Ltd. That can’t be the way a bona fide property developer goes about its business. Anyone can see from a mile away that this is not a project that is ever going to be completed. There is still no feasibility report for the project. The fact that the government has not shown any interest in seeing the full agreement signed between City Square Projects (Pvt) Ltd and Engineering Projects India Ltd indicates that powerful figures in the government are in on the deal along with the promoter UTL Global Projects Ltd. This is the kind of major project which should have solid financial backing by a developer as in the case of the Port City project, where the developer pumps in all the money and takes the subsequent profit as his reward. The 300 odd families living in the Bambalapitiya flats should have the confidence that once they leave their apartments to make way for the project, they will get their rent allowance until the project is completed and they get their flats in the new development. The land on which the Bambalapitiya flats stand is a ten-acre rectangular block in a prime location, the likes of which cannot be found anywhere else in Colombo. As things stand now, the government is poised to give this prime land to a company which does not have the financial clout to be able to handle a project of this nature. This family owned company with no history worth talking about has brought in a reputed state owned Indian Company mainly for purposes of display. The government has shown no interest in finding out what Engineering Projects India Ltd has undertaken to do in relation to this project. Experience tells us that such governmental nonchalance can only be the result of massive kickbacks sloshing around. Bambalapitiya Flats redevelopment project: Govt. taken for a right royal ride? An artist’s impression of the Bambalapitiya Flats Redevelopment Project after completion. In 2014, a plan was floated to redevelop the ten-acre land on which the Bambalapitiya flats now stand. The land belongs to the National Housing Development Authority (NHDA). The plan to redevelop this property involved the demolition of the present blocks of flats and building six towers of 36 storeys each. The project would have a total of 3,762 residential apartments along with shops, offices and hotels. After the new project is completed, 285 apartments and 12 shops would be allocated to the present residents of the Bambalapitiya flats. It was a company called UTL Global Projects Pte Ltd registered in Singapore which brought up this proposal to redevelop the Bambalapitiya flats. At the initial stages UTL Global Projects Pte brought in as a partner, Patel Engineering Ltd, a listed company in India, which had extensive experience in real estate development and considerable financial clout. A tripartite MOU was signed on 29 March 2014 between UTL Global Projects Pte Ltd, Patel Engineering Ltd and the NHDA for this project. Subsequently however, Patel Engineering Ltd backed out of the project. At that point UTL Global Projects Pte Ltd purported to bring in another Indian investor Engineering Projects India Ltd, a state owned entity in India, which, too, has extensive experience in construction and real estate and solid financial backing. This government owned Indian company is already involved in water projects in Vavuniya and Puttlam with the National Water Supply and Drainage Board. The ‘consortium’ which was supposed to have been formed between UTL Global Projects Pte Ltd and Engineering Projects India Ltd applied jointly to the BOI on 12 September 2014 giving the address of the consortium as 151 Chin Swee Road, # 14-1 Manhattan House, Singapore. On the same day the BOI wrote to the NHDA and the Condominium Management Authority informing them that an application had been made to redevelop the Bambalapitiya flats at a cost of USD 250 million over a seven-year period and wanting to know whether they had any objections to such a project. On 25 September 2014 one Vinoo Gopal The Director Projects of Engineering Projects India Ltd wrote to UTL Global Projects Pte Ltd that Engineering Projects India Ltd was ‘on principle’ agreeable to joining in a project to redevelop the Bambalapitiya flats. Gopal had requested UTL Global Projects Pte to send him the MOU signed with the NHDA to enable them to take further action in this regard. He also said that his company would send a delegation to Colombo to discuss the scope of the work before finalising the consortium agreement between UTL Global Projects Pte Ltd and Engineering Projects India Ltd. One thing that does not appear right is that this letter from Vinoo Gopal of Engineering Projects India Ltd is dated 25 September 2014 whereas the application to the BOI by the consortium that was supposed to have been already formed by UTL Global Projects Pte Ltd and Engineering Projects India Ltd had been made earlier on 12 September 2014. Furthermore, Vinoo Gopal of Engineering Projects India Ltd wrote his letter of 25 September 2014 in reply to a letter that had been written to them by UTL Global Projects Pte Ltd on 12 September 2014. This means that an Indian government owned company agreed on principle to an overseas project in less than two weeks! Can any company, private or public make a decision involving a major overseas project that fast? Looking at the dates on these letters exchanged, it is clear that UTL Global Projects Pte Ltd wrote to Engineering Projects India Ltd making the initial proposal only on the day that they had applied to the BOI claiming that they were already in a partnership with Engineering Projects India Ltd and that they wanted to jointly execute a project to redevelop the Bambalapitiya flats! On 30 December 2014 Vinoo Gopal of Engineering Projects India Ltd wrote to the NHDA that they were in principle ready to join UTL Global Projects Pte in the project to redevelop the Bambalapitiya flats and that they were now in the process of completing the required documentation. He also attached a letter from the Indian Overseas Bank certifying that Engineering Projects India Ltd had the financial resources to be able to execute the 300 million USD project to redevelop the Bambalapitiya flats if it was awarded to them. This bank referral from the Indian Overseas Bank was signed by the Chief Manager – his name is not mentioned in the letter. For an Indian government owned company to have received an initial proposal for an overseas project on 12 September 2014 and to be at the stage of preparing documentation to join the project by 30 December 2014 looks quite unusual. After this point the government changed and the Bambalapitiya flats redevelopment project went into abeyance as the new government declared a moratorium on unsolicited proposals. Later, UTL Global Projects Pte Ltd managed to revive the proposal and it was approved by the Cabinet Subcommittee on Economic Affairs of the yahapalana government on 07 July 2015. Then the August 2015 parliamentary election intervened and the matter went into abeyance again. After the new government was formed, it was once again revived by the Cabinet Subcommittee on Economic Management by being approved again on 11 December 2015. Following upon that, on 14 December 2015, the BOI wrote to UTL Global Projects Pte Ltd that the BOI had approved the application they had made jointly with Engineering Projects India Ltd to redevelop the Bambalapitiya flats at a cost of 200 million USD. The project was also given a 15-year tax holiday. On 17 February 2016, the Minister of Housing and Construction Sajith Premadasa submitted memorandum No: 08/2016 to the Cabinet seeking approval for this project and recommending among other things that a Project Steering Committee be appointed to supervise and guide the project through its implementation. Cabinet approval was duly granted. On 19 April 2016, the General Manager of the NHDA wrote to both UTL Global Projects Pte Ltd and Engineering Projects India Ltd that the Cabinet had approved their joint project proposal and that in terms of BOI requirements, the two partners in the consortium should incorporate a company in Sri Lanka for this project. Thereupon, a company called City Square Projects Pvt Ltd was duly incorporated in Sri Lanka but it is unclear whether Engineering Projects India Ltd is involved in this new company. Be that it may, on 22 June 2016, a formal agreement was entered into between the BOI and City Square Projects Pvt Ltd. This agreement also states that Engineering Projects India Ltd is a partner in the project but this agreement with the BOI does not have to be signed by Engineering Projects India Ltd. Instead, it was signed by two directors of the local company City Square Projects Pvt Ltd that was incorporated for the project. In a further note to the Cabinet on 08 November 2016, Minister Sajith Premadasa recommended that in order to proceed expeditiously with this project, a gazette notification be issued immediately to acquire this site under the Condominium Management Authority law which provides for any condominium that is over 40 years old to be acquired. He had further recommended that the Bambalapitiya flats be declared a ‘Urban development Site’ under Section 2 of the Urban Development Projects (Special Provisions) Act No: 2 of 1980. This provision of the urban development law disallows appeals to courts regarding the acquisition of property for development projects. There are 300 housing units in the Bambalapitiya flats and once the project begins, the residents will have to vacate their houses until the new flats are built and they are allocated new apartments. Until such time, they are to be provided with a monthly payment as rent assistance. Once the final project documents are signed, the land on which the Bambalapitiya flats stand will be transferred to City Square Projects Pvt Ltd on a 99-year lease. On 25 November 2016, Minister of Megapolis and Urban Development Champika Ranawaka filed a Cabinet Observation bearing Ministry Reference 2015/MPD/Obs 06 stating, among other things, that the financial credentials of the developers did not appear to have been checked and that a proper feasibility study had not been carried out to ascertain the viability of the project. As of now, the Prime Minister, the Minister of Housing and Construction, the BOI, the NHDA and even the tenants of the Bambalapitiya flats appear to be under the impression that Engineering Projects India Ltd is involved in this project. Minister Premadasa has stated in his Cabinet memorandum on 17 February 2016 that ‘the redevelopment of the Bambalapitiya flats is a complex project which has to be undertaken with utmost care and expertise preferably by an investor/developer who has experience in similar work’. In his observations to the cabinet made on 08 November 2016, Minister Premadasa described the Bambalapitiya redevelopment project as ‘a novel and complex project the likes of which had never been undertaken in this country’. Hence, the involvement of Engineering Projects India Ltd is absolutely crucial. It is Engineering Projects India Ltd that has the expertise and experience in construction and real estate development and the financial backing to be able to carry out a project of this nature. The other partner in the consortium, UTL Global Projects Pte Ltd, is a company that was incorporated in Singapore only in February 2011 and its owners are three Indian nationals, Koorapati Premalatha Rani, Meena Pooja and Prashanth Koorapati; they are members of the same family. They don’t have any known background in construction or real estate development and are not known to have the financial resources to be able to handle a project of this nature. The original partner they brought in to do this project Patel Engineering Ltd did have a suitable background and financial resources for this project. But there are questions over whether Engineering Projects India Ltd has actually formed a consortium for this project with UTL Global Projects Pte Ltd. This has to be ascertained beyond doubt by the government of Sri Lanka before proceeding any further with this project. Because it is a government owned business undertaking, Engineering Projects India Ltd cannot invest any money overseas without the approval of the Indian Cabinet and other agencies such as the Reserve Bank of India. Have the necessary approvals been granted by the Indian government and is Engineering Projects India Ltd a shareholder of City Square Projects Pvt Ltd which has been formed to undertake the redevelopment of the Bambalapitiya flats? 1. Is Engineering Projects India Ltd actually in a consortium with UTL Global Projects Pte Ltd? 2. If so where is the consortium agreement? 3. Who are the shareholders of City Square Projects Pvt Ltd which will be receiving the land on a 99 year lease? 4. Have any local or foreign banks been approached by UTL Global Projects Pte Ltd to raise funds by pledging the Bambalapitiya land as collateral? 5. Why hasn’t the Project Steering Committee appointed by the Cabinet looked into the very valid points raised by Minister Champika Ranawaka in his Cabinet Observation regarding this project? It is up to the government of Sri Lanka and UTL Global Projects Pte Ltd to summon a press conference and explain matters to the public. If Engineering Projects India Ltd is actually involved in this project they, too, should be represented at any such press conference to allay public anxieties. We have heard how a primary dealer borrowed money from the Central Bank at low interest rates to buy high interest yielding bonds issued by the Central Bank itself. If we now have a so-called foreign investor who is trying to raise money for investment by mortgaging land owned by the government of Sri Lanka, how is that any different to the bond scam? If a vacant land is given by the government to a developer and the project fails, the government can take back the land and confiscate the deposit and neither party will be seriously affected. But, in this case, there are residents in about 300 flats who will have to vacate their houses for the project to commence. If it fails, they will all be left high and dry. The National Housing Development Authority (NHDA) would relocate the three hundred families living in the Bambalapitiya flats in a sixty storey building, after the flats were demolished for the proposed mixed development project, NHDA Deputy General Manager Sarath Kumara said. Mr. Kumara said the Bambalapitiya flats would be demolished in order to claim the 10.16-acre land for another housing and semi-commercial project by a Singapore-based Indian company. However, discussions were still ongoing with the people in the flats, and a date to knock down the building was yet to be decided, he said. Mr. Kumara pointed out that each family would receive Rs.50, 000 - Rs. 80,000 as rental for temporary places until the construction of the new sixty storey building was completed. He said an acre from the entire land, valued at Rs.11.3 billion, would be reserved for the relocation project. According to him, the construction of the new building would be completed in two and half years. However, the date of commencement is yet to be decided. Sources said the Cabinet approval for the redevelopment of Bambalapitiya flats was given on March 2, 2016. “This building, located near the sea, has decayed and become unsafe. The proposal made by Housing and Construction Minister Sajith Premadasa to implement the redevelopment of the Bambalapitiya flats with foreign investors recommended by the Board of Investment was approved by the Cabinet,” the government information department said. Received 24/07/16 Sunday Times Lk. Whilst 80 % of the genuine owners are trying to get the best deal in the re development of Bambalapitiya Flats collectively , another 20% are trying to sell the entire effort for their personal gains. 3 X Men & 2 X Women have been clearly identified. In fact our sources in CMA & NHDA have given their names. I request all Flatters to award them an ' Egg' treatment as a 1st step. Genuine owners should be clear of the main strategic point - not to vacate present dwellings under any circumstances unless GOSL build our relocating Tower or Towers within existing precincts of B Flats & re locate us ab initio. Please note that if we vacate & once the dwellings are flattened , we have no absolute ownership to talk. Our ownership & existing Flats are joint variables. No Flat - no ownership. Please don't get caught to Rosy Talks of the Emissaries going round from Flat to Flat promising Castles in Heaven. They do it for a few dollars more!!! Owners got to answer the CMA letter individually & we all must in unison send one joint protest letter . Individual letter can be short but to the point. Joint letter may have more details. It's critical that both types of letters should have the same core. We are sacrificing 1360 X perches. 01 perch = 15m LKR as @ now. So it's a whopping 1360x 15m LKR deal. 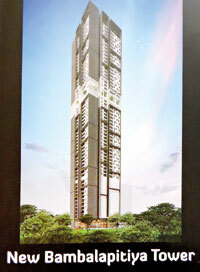 ( 20,400 m LKR) Our relocating tower/towers will cost the developer max 8b LKR. (it's better to get 2 X 25 story towers than 01x 50 stories! ) 20,400-8000 = 12,400m saving! Since we are sacrificing our common areas like open space, grounds, ample outdoor parking, let's all request for a 2000 Sft Apartment. Why do you want to be jealous of all getting something equal? Why do you want the Developer to make more money? Don't get caught to promissory notes, bank guarantees etc. Only a GOSL Sovereign Guarantee is 100% worth!!!! But GOSL is financially having difficulties & unable to issue Sovereign Guarantees. Hence we have only one option open to us. 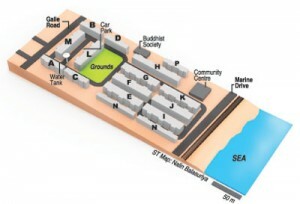 Please don't vacate unless GOSL relocate us within the existing precincts of B Flats abinitio. Our basic condition is non negotiable. Firstly I would like to thank you for the dedicating a page for this matter, this is a very good move by you and the following will be my Contribution to the flats future page on the matters raised by Mr. Lucky Ranchigoda, and the reasoning behind the creation of the Steering Committee. this is an important and critical time for a flatter. A. Under the Constitution of the BFWA - the Steering committee was brought in to facilitate information follow between all the flatters. Mr. Lucky Ranchigoda, puts it as adding fuel to the fire! I am very sad that he been a past president is commenting in his letter in this fashion. Everyone must know that this fire was started by him, and now we are doing our best not to let it blow up on the 298 + 10 stake holders. C. The steering Committee as mentioned is an internal mechanism that is in the process chartering a course action, and haven't met yet, the duty of the steering committee is to help people better understand all of this. We must understand that Pro and Cons must weighed by all stake holders, the steering committee will be able to get all feedback 298 + 10 and put in a format that would be easy for 298 +10 to know what the rest are thinking. and then choose the path all of them want to go in consensus this is the duty of this steering committee. D. The steering Committee is in the process of drafting a response on the falsified meeting minutes that was read out at the 2nd April Meeting held by the CMA/NHDA including the names of the 17 people who they say had signed the meeting minutes. Now this letter will be offered voluntarily to be signed by all those members of that issue. This falsified meeting minutes can and will be used by the authorities to put their first foot in and its the moral duty of the BFWA to protect 298 + 10. which includes Mr. Lucky Ranchigoda. E. If re-development is needed that is a decision that the 298 + 10 must make, and how they want it developed. As a family that lived in the complex for the last sixty years I can only submit my view point respecting the fact that others are entitled to their view. The buildings are over 60 years old and have deteriorated over the years. The Floor structures are weak and concrete lumps are falling down to the flats below and the iron grids are corroded and hardly existing. The sewerage lines are heading towards a complete collapse and some lines are built under the floors of the ground floors cutting across the compound. The Metal water lines are corroded and the volume of water wastage due to underground leakages is heavy. The roofs on most blocks are in bad condition and some are even attacked by termites they could collapse in the near future. The rear staircases on many blocks are completely destroyed by corrosion due to proximity of the sea. Block L is in very bad condition of all blocks as the sea breeze hits it direct. A certain block has registered a very high number of deaths at mid ages due to Cancer caused by inhaling sewerage gas from a leaking system. The government has considered redevelopment over refurbishment since 2014, after a study due to the age and the weak infrastructure of the buildings. Redevelopment of the complex is a very good idea that will not only benefit the community and the future generations of BAMBA flatters. but also will keep in line with the future development plans of building a magapolis city as our country and we need join hands to move forward. The authorities called for a meeting of all the residents of the flats and went off the agenda and made a very poorly planned and unprofessional presentation of a redevelopment plan and created a pandemonium giving rise to fear psychosis among the residents. A mega plan of such magnitude should be introduced and discussed with all stake holders more cordially and offering the residents the flexibility to make their suggestions. On the heat of this environment the Welfare Association has created a self appointed steering committee and has added fuel to the fire without weighing the pros and cons of such an opportunity for the benefit of the community without any concept paper on hand. Must understand and take into consideration the true reality on all aspects of what is mentioned under the heading Why redevelopment above truthfully. Must understand that Sri Lanka is not a country that attracts queues of investors banging on our doors to invest. Considering the fact that our country changes the policies from one administration to the other and even the principles of politics are based on a melting pot of politics, religion and language. We are lucky there is an investor and should consider all aspects of the offer to make our suggestion in a fair manner for all parties. Most of us who are lucky to have inherited from our parents and those new comers who have bought flats recently must have a vision to see to the future what we will leave behind for the next generation of younger flatters and their children. Will U like to leave behind a flat that will be more depilated and crumbling down for your children or will U be happy to own a new flat that will be worth three times the value of the current price and also have all the modern facilities for U to enjoy for the rest of your life span and pass on to the future generation of children that could carry on in the nostalgia of BAMBA FLATS. Must understand that this is a partnership that must give utmost consideration and priority to ideas of the community and address their concerns and fears. They must address the major issue of displacement and consider other options available to the developer. Can the project be done without or partial displacement? Displacement of 300 families to the already saturated rental market thriving on artificially high prices will only create havoc in the supply and demand of the market place. They should work out a well structure guarantee policy that will cover all aspects to safeguard the community interest and it should be legally bound to satisfy the community. There is no point in mentioning the other details of the offer as they were verbal and could be considered after receiving a concept paper. Since this land area is surrounded by two major road fronts and will also be embedded within the port city to be built in the future it will have to be considered as a important land mark icon of the future and when selecting the developer and the quality of the type of buildings a high standard will have to be set and considered some examples to consider will be complex such as Havelock City or Cinnamon Flats. A rash rush in to the situation can be very detrimental to our community and the landscape of a megapolis city plan. This will be a good opportunity to develop a very important plot of land in close proximity to the city in a very modern manner for the utmost benefit of our community and the future of our country. We must wait for a concept paper from the authorities. After we receive this document it should be discussed by each block and our suggestions should be listed out. We must be open minded when listing our suggestions not to be one sided as this is a partnership that should benefit both sides. Once all the blocks have put down our thoughts we will be in a position to compare and outlined a final list with the common factors and a selection of the best should be presented for consideration by the authorities. This may be the only opportunity we might get in our life time and let us not let it slip away without consideration. Let us not do the devil dance of personal empty victories of NO TO REDEVELOPMENT or we STOPPED REDEVELOPMENT. Because I am sure that some of these very people will secretly prefer a new flat with all modern facilities that will triple our equity. Not accepting true reality and not making use of the good time to negotiate diplomatically to get the best deal for ourselves will only drive the community into a weaker position in the future times to come. Our flats might well hold on for the next 5 years in a way till some of us that our old live but let us not be self centered and selfish to regret leaving behind buildings that will be crumbling down for our loved once that they would call THE GREEN GRASS OF HOME. As for the rumor "demise of the Flats" It is news to me. there are lots of rumours going around about the flats being taken over by someone --the Koreans . they say . But nothing is certain. I will let u know if something definite comes up. a. The existing flats will be re-furbished or demolished and new luxury apartments will be built. Over the years they have been poorly maintained. b. The plan is that the existing tenants will get displaced to a place close to Kotte. c. I am sure a private vendor with government backing will make a big fortune on this while many will be made insecure and unhappy. I have not heard of any rumour of the demise at this stage, however I keep in regular contact with my cousin who will advice me of any developments..
Re the demise of the flats wow, that is hard to believe unless 300+ families decided to sell at once because all of the flats are now privately owned no one has the authority to acquire the land it is built on as far as I know. Your best bet would be to contact (name deleted) who lives in Melbourne and was at the get together in March. His sister (deleted) still lives there @ (deleted) block. or (deleted) he was part of the body corporate sometime back. My guesstimate of it's value would be no less than 1.5 billion Rupees if not more considering a 3 roomed unit sells for more than 7 million even the converted garages sell for 4+ million. If you find out before me let me know. Demise of the flats - two points. Party on the green with a movie - I mean in Ceylon. I also wonder at the bodies and other items they may find - best just to let it be. Last I heard was that the flatters had some letter sent to them from the ‘Urban development Authority’, for them to sign and so far they have refused. They want to see the act which the letter refers to before signing anything. There are lot of rumours floating around and one is that the government want to sell this land to some Chinese developers to put up apartments and the flatters will be given the first preference to buy them off the plan. Isn’t it great that you have to BUY your own property from them? When I was in Sri Lanka I also heard about the future plans for the Bamba Flats. Right now they are only rumours but the future who knows. evelop such a big extent of land, but anything is possible in the present scenario. We just have to wait and see. Have no info regarding the demise of the flats, but I have read in a UK newspaper that the "Coast Conservation Department" have been active in demolishing small hotels, & other buildings (against owners wishes) in areas around S/L to make way for new govt: projects. Maybe the flats is on the target list?. continued chatting to find out from him that the govt. was planning to bring down all the blocks and build new high rise ones. It seem to be common knowledge. We still own a flat and nothing of that sort. Hope I am correct, but will call my mom and confirm. Re the Flats, I have not heard of any such rumour. I did read that the Housing Ministry had decide not to get involved in maintaining Govt Flats anymore. That was something the Welfare Society of the Flatters had to sort out. Other than that, I have not heard anything so drastic. I am doing alright! Will be in colombo in July, there is plans to build a hotel on the land but not sure if its going to come tru. and here is what i gathered its nothing new but already suggested but myself and some other old timers. Considering the age and condition of the flats this would be the most reasonable thing to do. they will be given free apartments. 2. where J an K stand comes the next block housing the rest, you can do your calculations on this. 3.once all are housed then the public areas will be built and the rest of the apartments. So dont pay heed to the scare mongers. 4. there will be enough of land left to build hundreds of apartments. Any way dont feed the panic mongers. Well there is strong rumour but they cannot find a property developer to take over and develop such a big extent of land, but anything is possible in the present scenario. We just have to wait and see.